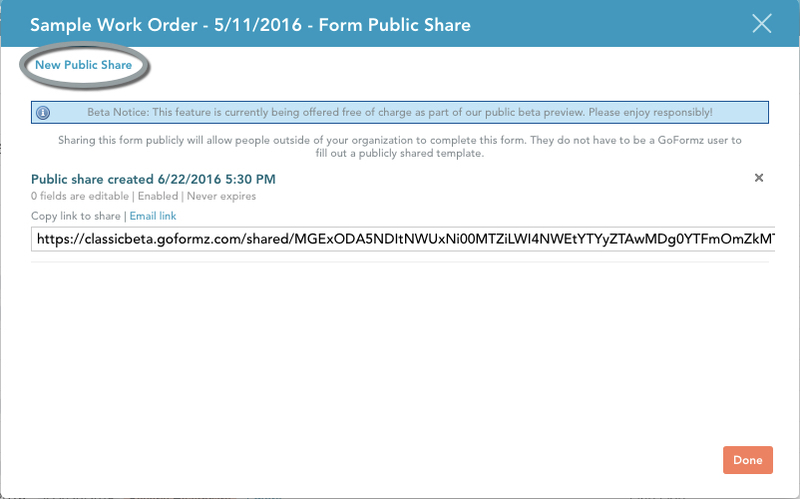 GoFormz Public Share lets you share a form Draft with people outside of your account, allowing them to fill out portions of your form. There are many situations where this is useful. For instance, you may want to include a customer’s own description of a problem on a work order; or you may want an outside inspector’s signature on a completed work order. Important note: This article is about sharing draft forms via Public Share. Click here to learn about sharing your templates via Public Share so people can create new draft forms. This works by generating a Public Share URL, which can then be distributed via email. When the recipient loads the URL, they will see the form in the Public Form Editor, where they can fill it out. 1. Access the Public Share window. Navigate to the Forms Tab in the GoFormz web interface, expand the [...] Actions dropdown next to the form you want to share, and select Public Share. Note that this functionality is only available for drafts — completed forms cannot be shared. 2. Create a new Public Share. In the Form Public Share window that appears, click the New Public Share button in the top left. A new public share will appear, with the current date and time in its timestamp. 3. Choose which fields you want to be editable**. By default, the form has no editable fields. To make select fields editable, click the “0 fields are editable” text and choose those fields in the new window that appears. In this example, we selected the “Date” and “Reported Problem” fields. Click “Select All” to make all fields editable. Click Done to dismiss the window. 4. Choose an expiration time for the Public Share link. By default, the link does not expire. To change this, click the “Never expires” text and select an expiration date and time. 5. Share the link with the desired recipient. You can either copy the link URL from its text field, or click the Email link button to auto-generate an email containing the link URL in your default email client. Below is an example of a fully configured Public Share link. It has 2 editable fields, and expires at noon on 6/22/2016. **Note on database fields: If your form has a database field that you want to make accessible via Public Share, you have to make the DataSource for that database field publicly available. Otherwise, people will not see the set of options for that field. To make the DataSource publicly available, select Manage DataSources from the More menu at the top of the app, and toggle on the Public switch of your DataSource. See here for more on DataSources. There are two ways to determine whether a form has been submitted via a Public Share link — a manual way, and an automatic way. Navigate to the Forms Tab, expand the [...] Actions dropdown next to the form you want to share, and select Public Share. You will see a list of all Public Share links associated with your form, as well as their statuses. If the form was submitted using a Public Share link, it will say so here. You can set up an automatic notification (or some other automatic event) to occur when a Public Share form is submitted, using GoFormz Workflow Automation. See here for more on Workflow Automation. To view all existing Public Share links for a particular form, navigate to the Forms Tab in the GoFormz web interface, expand the [...] Actions dropdown next to the form you want to share, and select Public Share. The Form Public Share window will display all existing Public Share links. In the example below, there are two links, the second of which is no longer active because the form was submitted. This window also lets you view, edit, enable/disable, and delete existing Public Share links. To view the status of a Public Share link, just look at the light grey text in the share. It will tell you how many editable fields the link has, whether it is enabled, when it expires, and whether it has been submitted. The example above has two links, one of which is no longer active because the user has submitted it. To edit a Public Share link’s set of editable fields or expiration date, click the “X fields are editable” or “Expires…” links, respectively. To permanently remove a Public Share link, click the X on the right side of the link. To temporarily disable a Public Share link, click the Enabled text to toggle it to Disabled. You can toggle it back to Enabled in the same way.